Auburn Mayor Jonathan Labonte addresses media at Maine Mayors’ Coalition press conference, urging lawmakers reject Governor LePage’s revenue sharing cuts as part of FY 14-15 budget proposal. (Originally posted 11 Jun 2013) Last week a press conference was held at the State House’s Welcome Center where leaders from Portland, Lewiston, Auburn, Augusta, Gardiner, Waterville, Sanborn and Bangor addressed the media and voiced concerns regarding the impact Governor LePage’s proposed zero revenue sharing cuts will have on their communities. Dozens more municipalities across the state have sent resolutions and communications to the Legislature protesting the cuts. Heck said of the man who was mayor of the city from 2004 until he became governor in 2010. UPDATE #1: Originally posted in June 2013 and oh, what a difference a year made. 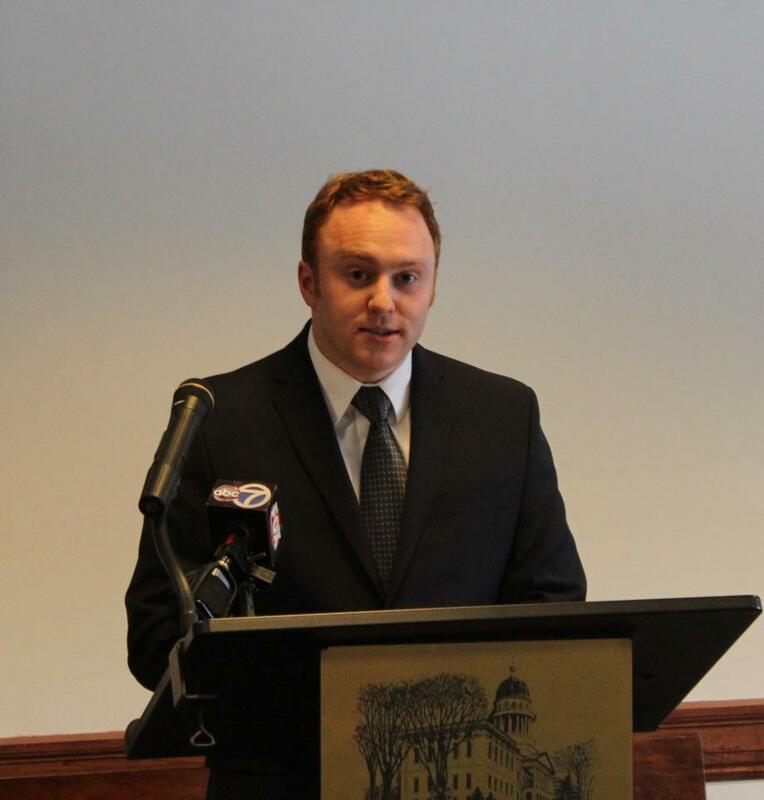 In June 2014, Governor Paul LePage selected Auburn Mayor Jonathan Labonte to serve as Office of Policy and Management director, as outgoing head Richard Rosen had been tapped to temporarily take over at Department of Financial Services for the retiring Sawin Millett. The chance to serve the state of Maine and the governor was one he (LaBonte) couldn’t turn down, he said. “When a governor calls and asks you join their team, that’s a unique opportunity,” LaBonte said. LaBonte said he did not believe his appointment had anything to do with election-year politics. “If there’s anything political about this, it is the governor was eager to see this office created and is looking to see works delivered out of it,” LaBonte said. DAFS Commissioner Richard Rosen presents the LePage FY 2016/2017 biennual budget to AFA, 1/13/15. LaBonte, who also is the director of LePage’s office of policy management, said Wednesday during a briefing with reporters that fears the proposal would decimate municipal finances are overblown. He said in 2008 revenue sharing only accounted for 5 percent of municipal budgets statewide and that the figure had decreased to 3.5 percent by 2012. “So revenue sharing is not a large share of those municipal budgets and certainly not a large share of what’s going toward those expenditures,” LaBonte said. When revenue sharing was first put in place, its intent was to provide property tax relief. Because the funding was directed to municipal government and did not go directly to property owners, they never ultimately benefited, LaBonte said. 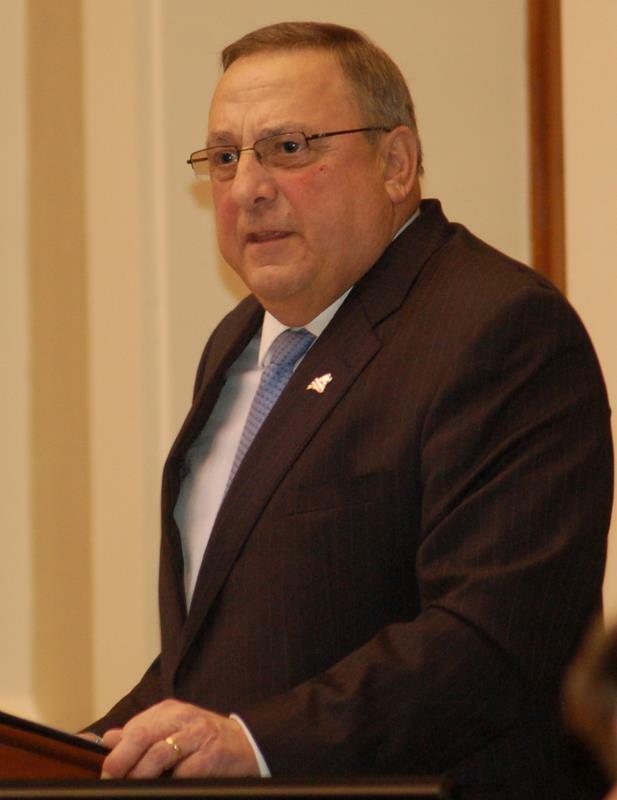 On Friday, Governor LePage attempted to minimize the effects of municipal revenue sharing and the impact its removal will have on Maine’s 460 plus cities and towns. So same as 2013 Governor Paul LePage thought 2009 Mayor LePage wrong* on municipal revenue sharing, apparently 2015 OPM Director/ LePage team player Jonathan Labonte seems to now think that 2013 Auburn Mayor Labonte was making a big deal out of nothing. 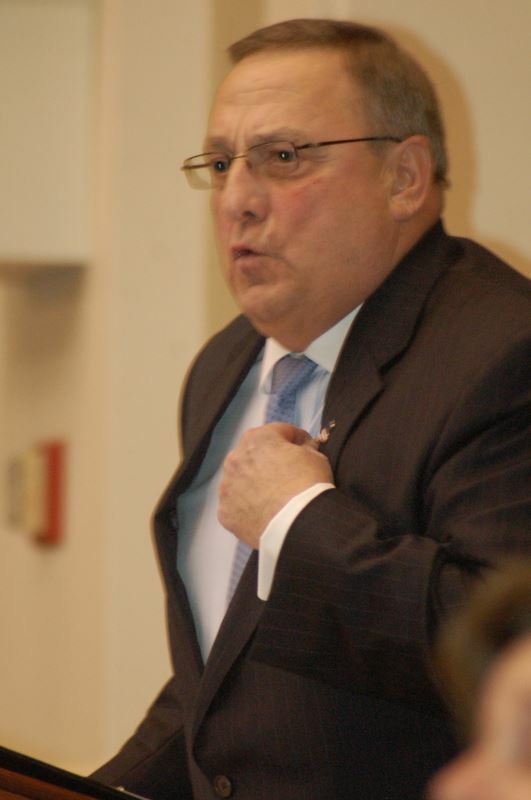 *RELATED: Video: Did 2009 Waterville Mayor Paul LePage Rip 2013 Governor LePage For Revenue Sharing Cuts To Towns, Education Funding Failures? Least surprising headline of the day: "Auburn mayor, who works for LePage, calls governor’s reform plan a plus for cities, taxpayers." @andiparkinson2 @bensprague @ScottCuddy1 Maybe want a little context? I called for $ for muni consolidation first, no muni would join. @MayorLaBonte @bensprague Please do; email is andiparkinson@gmail.com. Many thanks! (2/16/15) As Labonte continues to see his own position as not inconsistent, this post is being updated below with more conversations via Twitter today. 2013 @MayorLaBonte on revenue sharing (2/3): "These are the revenues that keep your property taxes from skyrocketing and …"
2015 @MayorLaBonte : "revenue sharing not large share of municipal budgets, certainly not large share of what’s going toward expenditures"
@andiparkinson2 @bensprague @jsavage207 I've certainly learned you can't compromise w/everyone. Coalition let me down on 2013 agreement. @MayorLaBonte @bensprague @jsavage207 Sir, that's not the issue I have so much as your 2013 vs 2015 180 degree statements. Which was right? @MayorLaBonte @bensprague @jsavage207 Not asking about other mayors, staffers, MMA, or even @Governor_LePage. Simply you, 2013 to 2015. Thx! 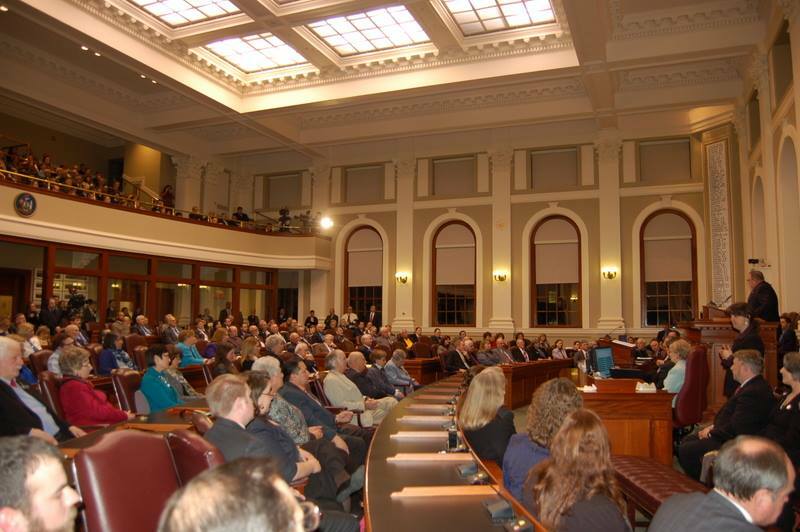 Last week, the Republicans in both legislative chambers of the Maine State House selected their leadership. Senate President Mike Thibodeau:“I cannot begin to express what this means to me. It is a true honor to be chosen by such an outstanding group of people to lead not only them, but the entire Maine Senate. As has been noted in the past, both Thibodeau and Cushing have long-standing ties to ALEC, as do a number of other returning Maine GOP senators and incoming Kim Rosen, wife of former State Senator Richard Rosen of Bucksport. Over in the House, Republicans chose to retain 126th Minority Leader Ken Fredette of Newport to serve again in the 127th in that office and replace outgoing Alex Willette, who resigned to take a position with the LePage re-election campaign, with Rep. Eleanor Espling of New Gloucester. On Wednesday, Democrats held separate caucuses to select their leaders. The House Democrats had lost a few seats in the recently concluded elections, but managed to retain their majority. While Speaker of the House Mark Eves was not challenged for his seat, the other two leadership positions went up to votes by the caucus, with Rep. Barry Hobbins going up against Assistant Majority Leader Jeff McCabe for the Majority Leader spot last held by termed-out Rep. Seth Berry (Bowdoinham), and 126th freshmen Rep. Lori Lister Fowle (Vassalboro) taking on Rep. Sara Gideon (Freeport) for McCabe’s chair. Ultimately the body selected McCabe and Gideon to join Eves as their 127th Legislative leaders. Speaker of the House Mark Eves: “It is an honor and privilege to lead our strong and historic 83 seat majority. With Election Day behind us, now is the time govern. We must come together with Governor LePage and our Republican colleagues to address the challenges we face as a state. We cannot allow the partisan battles of the past dictate our future. The Senate-elect Democrats, who saw their 18 majority shrink to a 15 seat minority last week, held a caucus Wednesday evening in Hallowell. Democratic Senators congratulate Dawn Hill as being selected as Assistant Minority Leader. To her right is Senator Justin Alfond, who will be moving from the podium as exiting Senate President to serve as Minority Leader for the upcoming 127th legislative session. They chose outgoing Senate President Justin Alfond of Portland to serve as their Minority Leader in the upcoming 127th legislative session. Alfond is in his final term and served in the 125th Legislature as Assistant Minority Leader to then-Senator Barry Hobbins’ Minority Leader. Senator Dawn Hill of Cape Neddick, who chaired the 126th Legislature’s Appropriations and Financial Affairs Committee and was honored as Emerge Maine’s Woman of the Year along with fellow AFA Chair Rep. Peggy Rotundo of Lewiston, was chosen to serve as Assistant Minority Leader for the next two years. 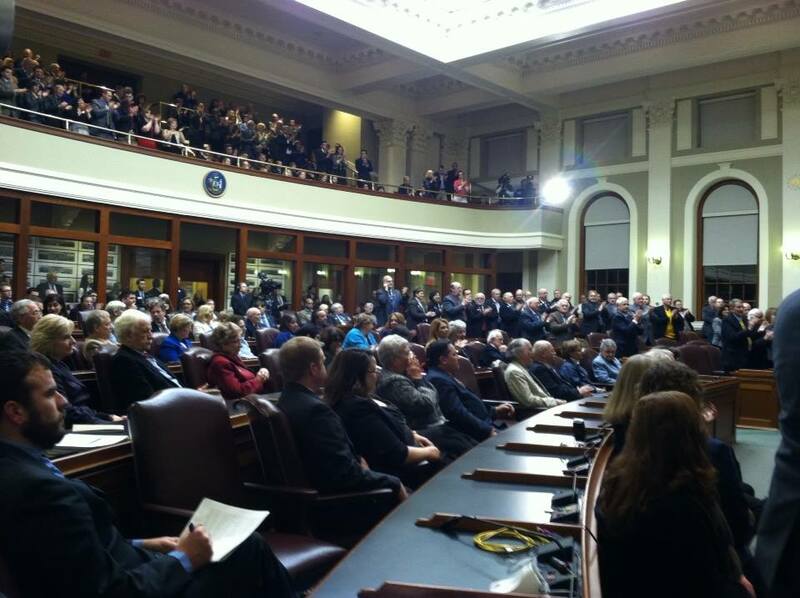 The 127th Legislature will be sworn into office on December 3 by Governor Paul LePage. Here is the floor speech of Rep. Anne Graham (D- N Yarmouth) supporting LD 1487, “An Act To Implement Managed Care in the MaineCare Program”. Ladies and Gentlemen of the House, what would you do if you have lied awake for countless nights because you feared you would lose your life or your loved ones’ life? You (or your wife) found a lump in their breast a while ago but were afraid to go to the doctor not because of the fear that it was cancer but because your family could not afford to get the care that you needed? What would you do when that mole that you have on your arm is changing and you just hope it is just dry skin and it will go away? You can’t sleep because if you have it checked it might be melanoma and it will likely open the door to bankruptcy. How do you decide? Get care or go broke? It is a matter of life or death for those people we deny health care coverage to. Gail McLean is a member of my community. She is the model of a self-made woman. She built her farm and her home with her own two hands. She doesn’t ask for a hand out. What she asks for is to not face complete financial ruin if she is injured or she is diagnosed with a severe illness like cancer. She lives a healthy lifestyle. You won’t find her sitting on her couch drinking and smoking. She and many others like her are working hard to make a living. Are these the people we should deny healthcare? I have heard the argument that these people could just go to the hospital or local clinic because they can’t turn anyone away. That is true but at what price? Do you honestly think that your insurance premiums won’t go up when hospitals raise their fees to cover the uninsured? And that local health clinic closes their door because they can’t continue to run in the red. Healthcare is not free. The solution is to accept the federal dollars that many other states have. States like Arizona, Michigan and New Hampshire have recognized that in it is the right fiscal thing to do and the right moral thing to do. The argument that that everyone should go on the exchange is false. Yes, one can purchase an insurance plan for $50 per month with a $2,5000 deductable. When one makes less than $12,000 a year, this is an impossibility. Once again, lose your life or lose your livelihood. I ask, what choice would you make? It saddens me deeply that this debate has become more about politics than about people. That is not why I am here. I venture to say that that is not why my constituents or yours sent us here. We have a common sense bipartisan compromise before us. A compromise that will save money by providing care in a smart cost effective way. We should embrace this compromise and not ignore the hard working farmers, weavers and fishermen who are just trying to make a living. My friends, thank you for serving the people of our state. I ask you to have an open mind and really think about the impact the decision to deny health insurance to close to 70,000 fellow Maine neighbors will have. I am here to serve the people of my community and state as are you. I am not here to serve a political master and hold an unbending ideological stance. I admit this vote comes not just from my common sense but from my heart. I will vote to accept to federal dollars to cover more Mainers. I will sleep well tonight knowing that I stood for my neighbors and friends. I ask that you do the same. Thank you ladies and gentlemen. Thank you Mr. Speaker. Here is video of are Rep. Jones’ floor speech and transcribed remarks as prepared for delivery. I rise to speak to the decisions that we must make and the actions that we must take, in light of the conflict between what we earnestly believe the right thing to do is and what we realistically can accomplish, between the ideal and the real constraints under which we work. Is the legislation before us perfect? Of course not. Is it the best we can do for our citizens on this day, given its imperfections and our differences? Yes. Is there a viable alternative plan before us today? No. I rise to speak of the values of the citizens I represent, and these values are visible and their benefits are tangible for all in our community to see. Mr. Speaker, the citizens that I represent volunteer as firefighters and emergency medical personnel; we volunteer to teach the illiterate to read; we keep jumper cables, a chain, and a bucket of sand in our pickups to help those who have gone off the road in the winter. And we help the so-called worthy and the unworthy equally. We collect donations and provide heating fuel for our neighbors, because we believe that no one should be cold in the winter. We have a vibrant volunteer food pantry, and we have community gardens because we believe no one should go hungry. And, we place a jar on the counter of our local general store to collect donations for a family who’s experienced misfortune or, most relevantly to this discussion, illness. That every one of our fellow human beings should be healed when sick is a belief I know, Mr. Speaker, we all share. It’s essential to our nature of empathy and our understanding of compassion. But the collection plate in church and the donation jar in the general store have demonstrated they cannot completely fulfill this purpose. Nor have the directives to “work harder” or “get a better job” met this need. We have heard today that we cannot afford, we do not have the money, to provide this remedy for our fellow men and women. Mr. Speaker, we cannot serve two masters: we will hate one and love the other; or we will be devoted to one and despise the other. Mr. Speaker, either we serve the master of compassion or we serve the master of money. We choose today whom we will serve, the master of benevolence or the master of selfishness, and today eternity is witness to our actions. Mr. Speaker, heaven have mercy on my soul if, on my travels from Jerusalem to Jericho, I pass by on the other side of the road when I see a man, beaten and naked in the ditch. Mr. Speaker, the dignity of each human person and the pursuit of the common good are concerns which ought to shape all of our policies, even if the instrument before us is imperfect. Mr. Speaker, I ask each member of this body to consider his or her conscience and faith when we vote. 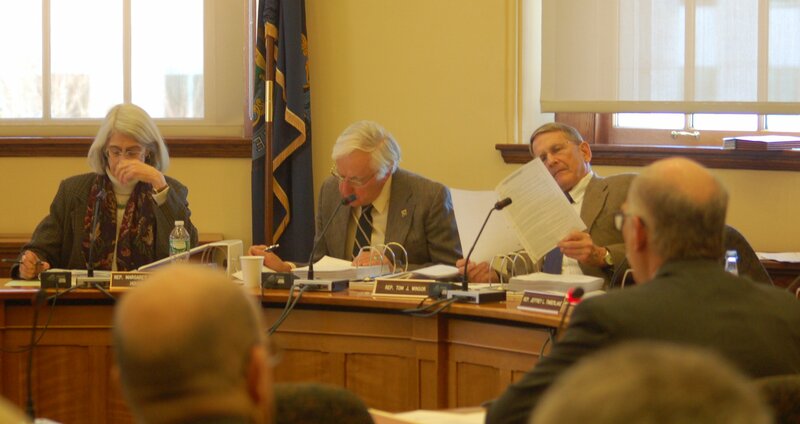 Last week, both chambers of the Maine Legislature took up and voted to override Governor LePage’s veto of LD 1353, “An Act To Further Reduce Student Hunger”. 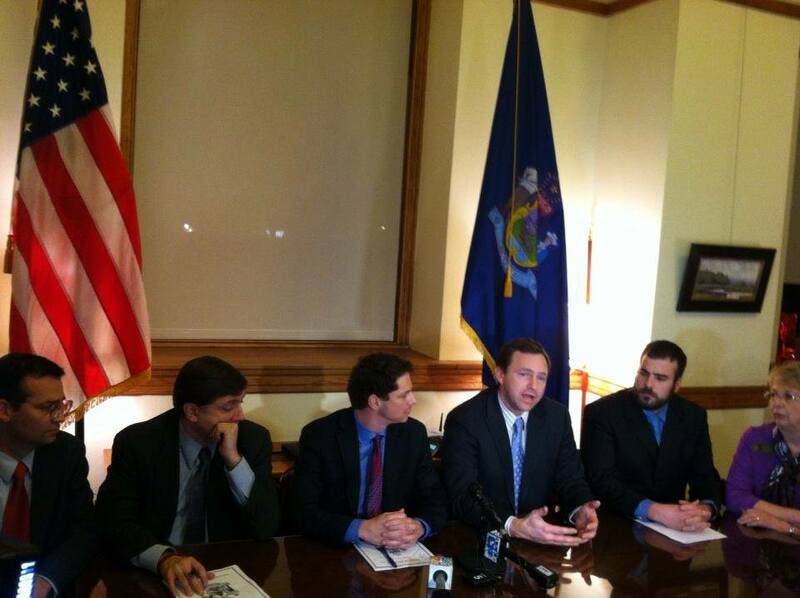 The Senate first took up the veto, sponsored by Senate President Justin Alfond. When I was 9 years old and living in Dexter, Tom was my classmate. We were friends and he liked to play sports. Back then, and through my 9-year old eyes, I remember he was “that kid” who got called down to the principal’s office. He was “that kid” who stayed in during recess. He was also “that kid” who missed a lot of school. What I realized later, with my adult eyes, is that Tom was “that kid” whose family–although they worked hard–didn’t have enough money to make sure Tom got enough food. He was hungry. I am sure that we all knew or know a Tom? Maybe there are a few of us in this room that was Tom? As a past member of the education committee, I now know that hunger is one of the most severe roadblocks to learning. A child who doesn’t have enough to eat, won’t do as well in school. They’re more likely to get sick more often—and, less likely to finish high school. Tom was “that kid”. That was more than 25 years ago. Today, there are 84,000 students who qualify for free or reduced lunch. Today, twenty percent of Maine kids are food insecure–that’s nearly one in five. Today, the state of Maine ranks third–only two other states in America have more children in hunger. That’s a list that we shouldn’t be on. In fact, that’s a ranking we should be ashamed of. Sometimes, the best solutions are the simplest. This bill is one small step–one common sense step toward making sure a hungry kid in Maine has the opportunity to get one meal a day during the summer-vacation months. Feeding hungry students is nothing new. We already have a program in place for making sure hungry students get fed during the school year. It’s a federal program, that Maine schools take part in. It’s called the National School Lunch Program. And feeding students during the summer is nothing new. In fact, the first summer food program began in 1968. Government–and our society–has long seen the need, and accepted the responsibility, to help provide nutrition to our neediest children. Today, if you all join me in supporting this bill (again), we can make a difference to 84,000 Maine kids who currently qualify for free or reduced lunch. Today, all we are asking–and expecting–is for the adults to have a conversation about the hungry children at their school, in their community. Today, we are asking schools who already offer summer programming like a rec program, to consider whether a summer food program is right for them. The food costs are paid for. The federal Summer Food Program picks up the food costs. The bill even allows schools to partner with churches or nonprofits or other community and civic organizations. In my home town of Portland, there’s a summer food program in the park—at Deering Oaks. The goal is to go to where the kids are and make it as easy as possible. But even still, if a school doesn’t want to participate, they can opt out. Ultimately, it’s a local decision. Some may ask, “Why is this necessary if schools already can ‘opt-in’ to a summer food program?”. The answer is simple: because there are still 70,000 kids across our state, in each of our districts, who are not getting fed in the summer. They are hungry. This bill is more than just a bill, it’s a pledge, it’s a commitment by all of us that we need to change course; we need to build momentum to help our most precious assets, the children of our state. Today, you have a second chance to help feed our state’s hungry children so that we can make sure all of our kids, even the hungry, have the basic building blocks to go toe to toe with their classmates or in fact with anyone, anywhere. Reps Ben Chipman, Tori Kornville rose in support; now Jeff McCabe. Peter Johnson (r-Greenville) spoke in opposition, saying that it should be left to local communities. Now Corey Wilson, (R-Augusta). He tells the chamber again of how he was one of these children and urges support in overriding the veto. Rep. Helen Rankin (D-Hiram) speaks to address her colleagues in the House (2013). Bruce Macdonald, one of the committee chairs, spoke and now Karen Kusiak. GOP Rep. McClellan of Raymond opposes on funding concerns later on. He also opposes it as a mandate. Unhappy that schools are giving medical care, etc and not simply teaching (paraphrase). 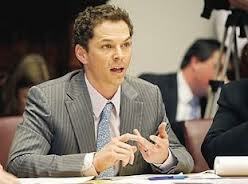 Jeff Timberlake (R-Turner) asks questions re: whether or not this is allowed in school; Seth Berry answering. Anne Graham speaking in support, tells how health and nutrition work together. Diane Russell (D-Portland) rises to ask “how did we get to a place where we are debating whether or not to reduce student hunger”? Jennifer DeChant (D-Bath) discusses her work in 1992 with national campaign to end hunger. Dennis Keschl (R-Belgrade) asks question re: better to educate schools on the program. Gay Grant (D-Gardiner) gives personal story of how the reduced lunches helped. Elizabeth Dickerson (D-Rockland) next, telling of her communities’ 40% lower income poverty that kids in her school live in, every day. That she has taught algebra and discovered that some kids have not eaten all day- she and other teachers routinely keep snacks in their desks for these students. Jeff McCabe )D-Skowhegan) answers the earlier Keschl question; now Brian Jones… Strong statement regarding body’s charge if taking care of common welfare of Maine citizens. Matthea Daughtry (D-Brunswick) next, another committee member. Scott Hamann (D- South Portland) talking about going to a school pantry in Biddeford yesterday and Hannaford’s helping. Terry Hayes speaks of how she just came from an ethical meeting. “We continue to add to what schools need to do”… Will vote to override, but understands the GOP argument. Paul McGowan of York also answers Keschl. Now Ray Wallace (R-Dexter) asks what folks had for breakfast or lunch when they were kids- grew up in family of 8 kids and single mom, no help. Did not suffer and was able to learn. Let the parent raise the child. They get food stamps; are they spending it on food… Or something else? Let the parent feed them!! If they aren’t gonna feed them, cut the welfare! Rep Soctomah next, was raised on state reservation. Speaks of her own background, very emotional issue for her. Rep. Helen Rankin addresses House; urges support of override. 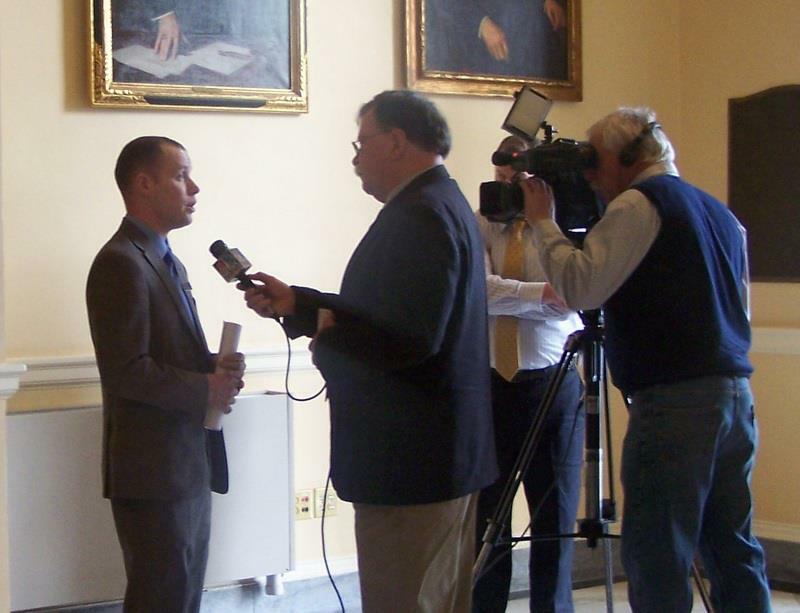 Rep. Corey Wilson (R-Augusta) interviewed by WCSH in 2013. I rise to speak in support of the motion before us; we must override the unfortunate veto of LD 1353, and Act to Further Reduce Student Hunger. One of the school districts I represent, MSAD 49 – where I served on the school board – has cooperatively participated in the Summer Food Service Program (SFSP) for a number of years. We serve children and youth who attend a community supported summer recreation program and children who attend a summer school program. (It may be that other school districts in my legislative district have summer food service programs, I don’t know for sure.) But I do know that my county, Somerset, has over 55% of our students qualifying for the federal lunch program. Our county, like other poor counties in the state, have children who rely on the school lunch programs for their basic nutrition. Children and youth up through the age of 18 who live within the geographic boundary of a school district with such a high participation in the school lunch program can participate in the Summer Food Service Program. The SFSP is funded by the U.S. Department of Agriculture and run by the Maine Department of Education. The Maine DOE already encourages school districts to participate in the program. Look at their child nutrition programs page – there is plenty of information about getting a SFSP started and suggestions for making the reporting and paperwork relatively easy. Yet, even with the 87 sponsors and 254 sites, still the Maine Center for Economic Policy calculated in 2011 that Maine was using only about 10% of federal USDA funds that we are eligible to receive for Summer Food Service Programs (SFSP.) That means that children and youth in Maine who are eligible for the program are not able to participate, and are likely going hungry or not eating balanced meals. More Maine children and youth can be served through SFSP. Holding more school districts responsible for SFSP is the right thing to do. Opting out is permitted – a school board need only publicize that it will be conducting a public hearing on opting in or out of the program and vote on the question in a public meeting. A School Board may opt out, for example, after noting and telling the community that a local recreation program offers the SFSP for children and youth in their community. However, where no such program is provided, this bill will encourage local school districts to participate in the program or provide an opportunity for local residents to urge – through the public meeting – that schools participate in the program. It is very simple. Overriding this bill is the right thing to do for hungry, developing (growing) children who need good nutrition, and it provides support for poor and working class families. Thank you Mr Speaker. Mr Speaker, Men and Women of the House. Yesterday I visited a food pantry at an elementary school in Biddeford. I saw wonderful families file through, gratefully gathering their groceries. Volunteers greeting them at the door, and offering their help. Hannaford was there. They had a nutrition specialist ready to answer questions and offer recipe suggestions specific to the types of food that was being distributed by the school pantry. Some girl scouts set up a table and were giving out free books. This is where community happens. In our schools. Our community activities and activity centers. That’s why it’s the perfect place to implement and optimize an available federal resource – the Summer Food Service Program – to address child hunger…something that no reasonable person would consider anything other than a dire concern. 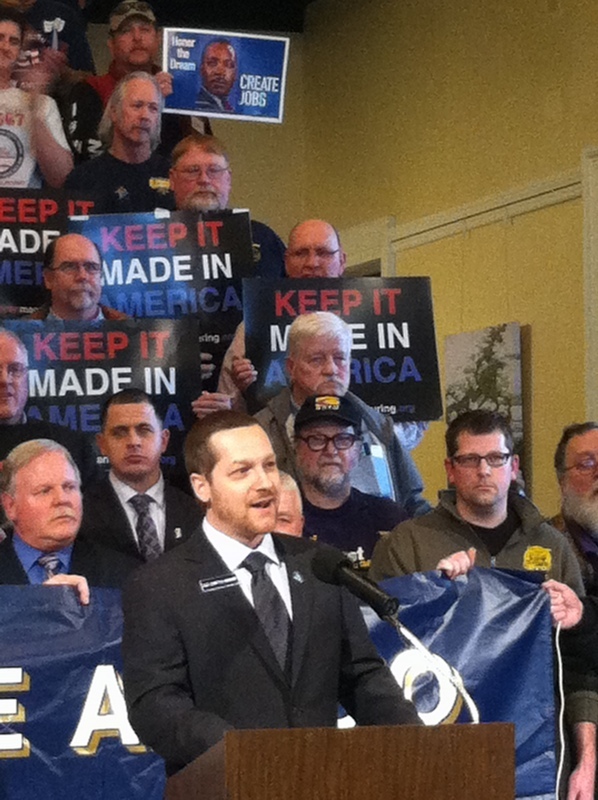 Rep. Scott Hamann (D- South Portland) speaks at a press conference is support of raising minimum wages. Hunger…doesn’t happen just 9 months out of the year. The hunger pains don’t go away just because a child finishes second grade and begins their summer vacation. They have three months to wait to start third grade, get back to school, and get back to more predictable nutrition. That’s not right. That student doesn’t come back in September equally as prepared as a student who spent their summer knowing where their next meal was coming from. That’s not fair. And that is what the Summer Food Service Program is designed to address, and why this food is fully funded by the federal government. We talk about opportunity, self reliance, education, an educated workforce. The building blocks of all those things is food security in childhood. If we want a world class labor force, we need to make sure that kids’ stomachs are full and their developing brains are getting the nutrients they need. In that respect, the Chief Executive’s veto of LD1353 is shortsighted. Why would we ever want to handicap our next generation’s workforce? Why wouldn’t we do everything in our power to ensure that we are delivering Maine’s business community the best employees possible? A generation raised free from food insecurity. This bill is a step in that direction. At a time when pantry lines… are almost longer than the list of excuses why we can’t rise to the challenge of addressing child hunger… hopefully this vote is unanimous to reflect how both parties unequivocally support the morally right and responsible effort to address child hunger. Hopefully both sides of the aisle can work together in the future as well to take further steps to address what ought to be one of the most bipartisan…nonpartisan issues in the state house – protecting a child’s next meal. Ultimately the House also voted to override the veto by a 2 vote margin, 92-45. Only four GOP members joined Democrats in overriding the veto: Rep. Corey Wilson, Rep. Joyce Maker (R-Calais), Rep. Matthew Pouliot (R-Augusta) and Rep. Ellen Winchenbach (R-Waldoboro). 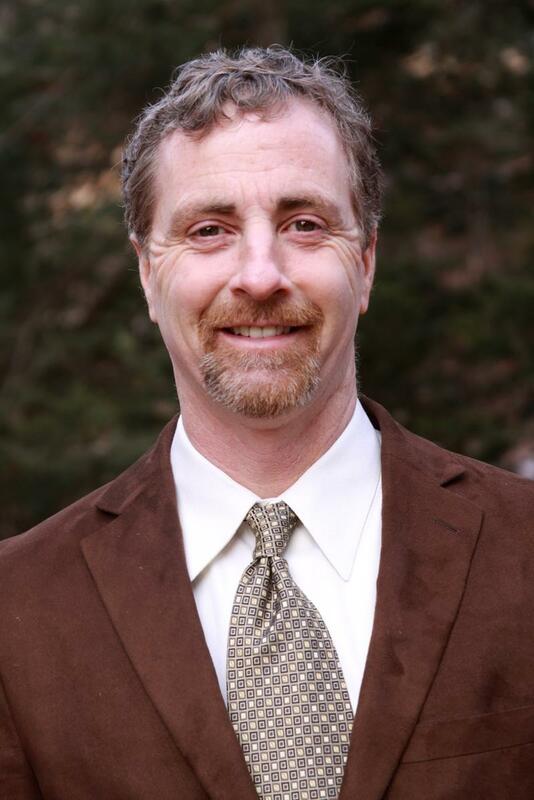 MADAWASKA – State Representative Charles “Ken” Theriault (D-Madawaska) has announced that he will run for the Maine State Senate in the district being vacated by Senate Majority Leader Troy Jackson (D-Allagash), who is running for Congress. Rep. Theriault currently serves as the House Chair of the Transportation Committee, and is House Chair of the Franco-American Caucus. In the House, he has been a powerful advocate for improving transportation infrastructure, as well as for restoring revenue sharing to local communities. Additionally, he strongly supports accepting federal funds to expand healthcare coverage to 70,000 Mainers, including 3,000 veterans. “Working men and women in Aroostook County need leaders in Augusta to fight for better jobs, and to fight to protect our manufacturing, agriculture, and logging heritage,” said Rep. Theriault. Rep. Theriault grew up in Wallagrass on a potato farm, graduated from Fort Kent Community High School, and attended the University of Maine at Fort Kent. He is a veteran of the U.S. Army and a member of American Legion Post 147. He has served as a Little League and youth hockey coach, is a director of the Madawaska Snowmobile Club and a member of the Four Season Trail Association, has chaired the Acadian Festival in Madawaska, and is a volunteer leader for the World Acadian Congress. He also enjoys hunting and fishing. He is a member of St. Thomas Aquinas Parish in Madawaska and is a former Grand Knight of the Madawaska Knights of Columbus. A retired papermaker, he served in leadership positions, including President, with United Papermakers/USW Local 291. As a union representative at Fraser Paper, he prided himself on being a tough but fair advocate for workers and on maintaining a respectful relationship between workers and management. Rep. Theriault lives in Madawaska with his wife, Patsy, a retired librarian. They have two grown children and four grandchildren. Senate District 1 is a new district created by Maine’s Constitutionally-mandated re-districting. It includes all communities in the former Senate District 35 as well as the communities of Ashland, Masardis, and Oxbow Plantation. GORHAM – Citing the difficult political climate in Augusta and the need to continue working on economic development, today Democratic Senator Jim Boyle of Gorham announced his campaign for re-election in the new Senate District 30, which includes all of Gorham, and most of the communities of Buxton and Scarborough. In Augusta, Senator Boyle has been a strong supporter of restoring revenue sharing to local communities, and accepting federal funds to expand health care to nearly 70,000 Mainers, including 3,000 veterans. He also sponsored legislation later incorporated into LD 90, a first-of-its-kind workforce development bill, to make it easier for students who didn’t finish college to return to complete their degrees and develop the skills necessary for new jobs in emerging industries. As the Senate Chair of the Environment and Natural Resources Committee, Senator Boyle successfully negotiated a bipartisan compromise on important solid waste legislation that will lead to increased recycling and a reduction of solid waste in landfills. 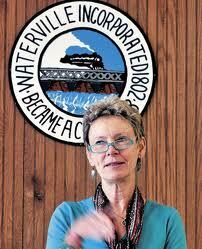 Senator Boyle owns and operates Boyle Associates, an environmental consulting firm. He cites his experience as both a small business owner and a senator as reasons for seeking a second term. Senator Boyle graduated from the University of Maine in 1980, and lives near the Presumpscot River in North Gorham with his partner, Sue, and their two dogs. He has two grown children, Jared and Lindsay. LEWISTON – Rep. Nate Libby (D-Lewiston) will launch his campaign for State Senate District 21, which comprises the city of Lewiston, at Museum LA, 35 Canal Street, Lewiston, on Saturday, February 22nd at 10:00 AM. 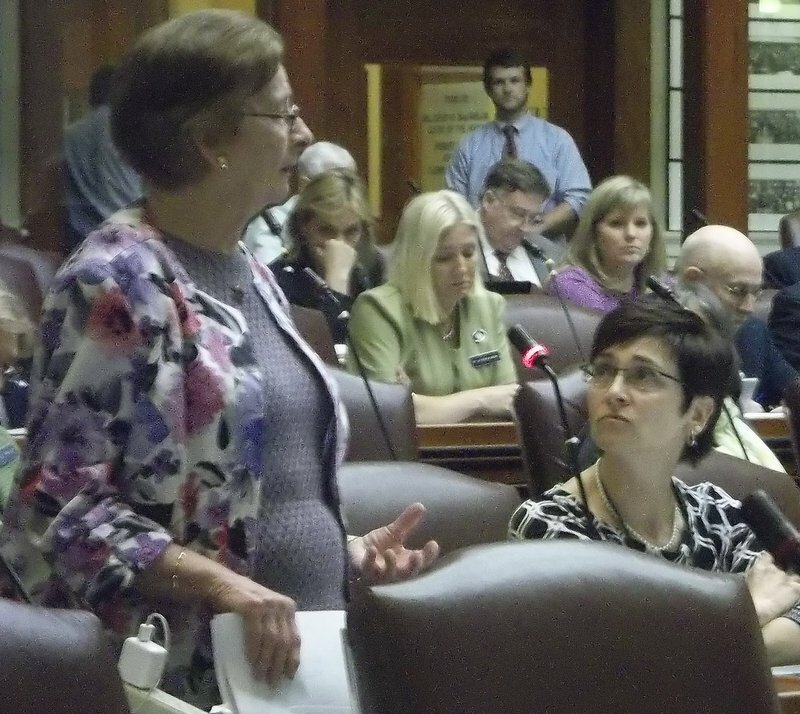 The senate seat is currently held by Democratic Senator Margaret Craven of Lewiston, who announced she is retiring after 12 years of service in the Legislature in order to care for her ailing husband. Senator Craven is endorsing Rep. Libby as her replacement. Rep. Libby is completing his first term in the Maine House of Representatives and has been serving on the Lewiston City Council since 2012. In the Legislature, Rep. Libby serves on the Taxation Committee where he co-sponsored legislation for comprehensive tax reform. He has also worked to restore revenue sharing, expand access to Pre-K education, and make health insurance more affordable. He serves on the board of Androscoggin Head Start, the Lewiston-Auburn Economic Growth Council, Lewiston’s Community Development Committee, and the working group for Lewiston’s first universally accessible playground. 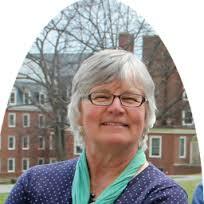 Rep. Libby is a graduate of Bates College and works as a consultant and landlord in Lewiston-Auburn. He is married to Andrea and has a four year old son, Jude. 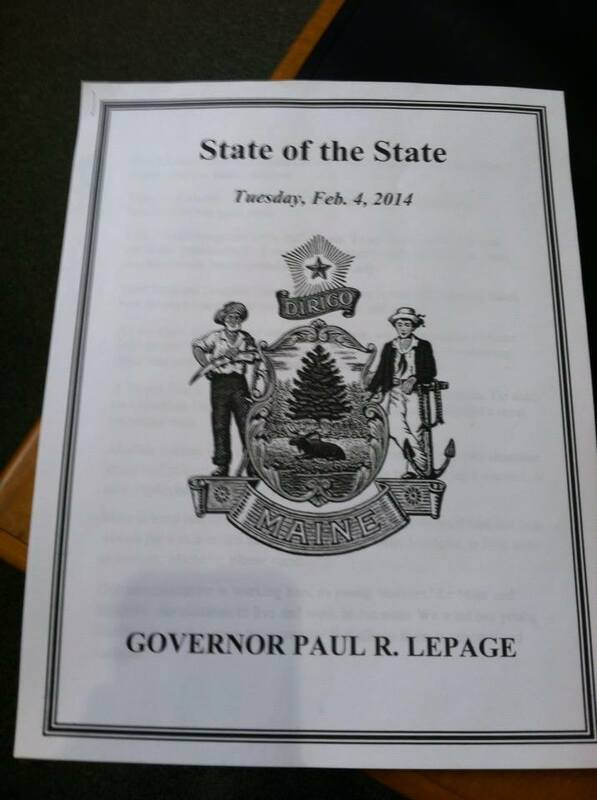 “Tonight, Governor Paul LePage will deliver the State of the State to the Legislature and to the people of Maine. For those of you who listen tonight, you may agree with what the Governor has outlined. Or you may not. But one thing all of us, as Mainers, agree on is that we want to live in a state that prospers. We want to know that our children will have a more secure and brighter future than our own. We want to know that our parents, as they age in to their twilight years, can do so with dignity. We want to know that if we work hard, we can pay our bills and put away money for our future. We know what a growing, and prosperous economy looks like. It’s an economy where our small businesses are thriving and innovating, with access to capital, and a skilled workforce. It’s where our kids get an exceptional education from our public schools–from pre-K to college and beyond. And where they choose to stay in Maine because the opportunities that lie ahead of them exist right here-in Maine. It’s where families don’t live in fear that mounting medical bills will lead to bankruptcy or the loss of their home. And it’s where the Maine economy is leveraging our competitive advantages–like our cities and town centers, our working forests, farms and coast land to attract people and new businesses. Mainers have a long history of prospering. And we can do it again. But we’ve got some work to do. The number of families who are living in poverty and homeless is rising more than ever before. In fact, and sadly, one in four children in Maine is hungry–it’s the third highest rate of child hunger in the nation. That’s unacceptable. Our economy is still lagging behind the rest of our New England neighbors and job growth is nearly stagnant. While our New England neighbors have regained ALL of their jobs lost during the recession, Maine has only regained one-third. As lawmakers you put us in charge to make the tough choices and come up with solutions to these challenges. And you’re right: it’s up to us. Inevitably there are those places where we may not find agreement–whether it’s providing health care to 70,000 Mainers, including 3,000 veterans through MaineCare expansion or keeping our funding promise to Maine’s towns and cities through revenue sharing. There’s plenty of room for disagreement but when political rhetoric trumps good policy, no one wins. We were sent to Augusta to serve the people of Maine. 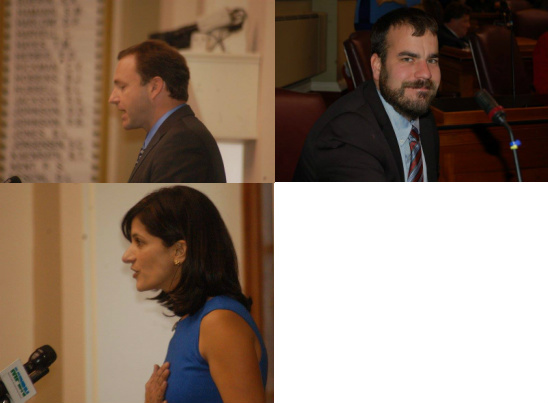 Immediately after the Governor concluded his 40 minute delivery before the joint convention, all Democratic leaders met in Speaker of the House Mark Eves’ office with media to give their analysis of LePage’s speech. Here is a full recording of their reactions. 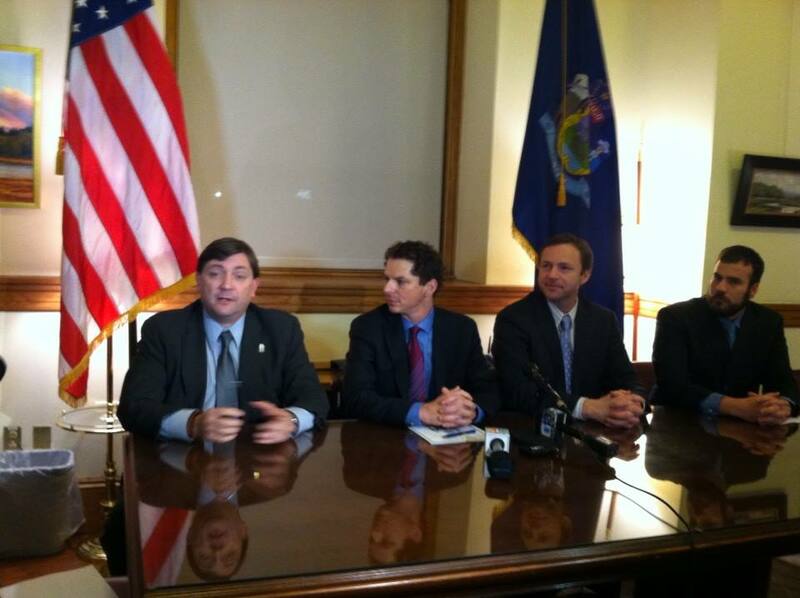 (L-R) House Majority Leader Seth Berry, Senate Majority Leader Troy Jackson, Senate President Justin Alfond, Speaker of the House Mark Eves, Asst House Majority Leader Jeff McCabe, Asst Senate Majority Leader Anne Haskell. Senate Majority Leader Troy Jackson (D-Aroostook): The Governor’s “open for business” zones are more like the Twilight Zone. “On behalf of our more than 230,000 members in Maine, AARP expects strong executive and legislative leadership across party lines,” said Lori Parham, AARP Maine State Director. “As the Governor stated, ‘it is time to put politics aside.’” AARP Maine was both surprised and concerned tonight that the discussion of fiscal security for families in Maine did not include any discussion of Mainers 50+. 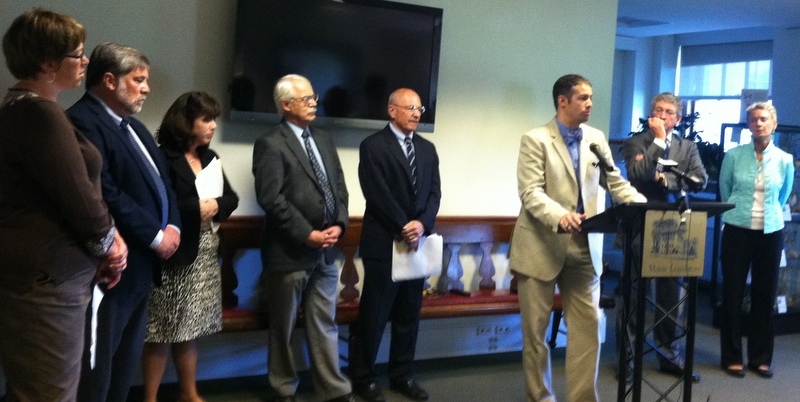 “Maine is the oldest state in the nation and these issues need to be addressed,” said Parham. AARP is disappointed with the Governor’s remarks regarding the expansion of affordable health care coverage in Maine. “AARP is working to ensure that older Americans who have lost their jobs and are struggling to find new ones can obtain needed health care,” said Parham. “People 50+ are, on average, out of work longer than their younger counterparts. AARP is deeply committed to ensuring that people between the ages of 50-64 without healthcare have options for coverage. This is a key component of retirement security for older Mainers.” Expanding Medicaid will give people without health care insurance access to preventive care that can save lives, ease overall health care costs and infuse millions into local economies. While AARP recognizes that Maine faces challenges in being the oldest state, there are opportunities which are important to acknowledge. Boomers come with income, energy, skills and a commitment to give back. More than 33 million people nationwide over the age of 45 volunteered their time and talents in 2012. The largest growing age group of entrepreneurs is aged 54-64; especially important in entrepreneurial Maine. Boomers feel a powerful sense of legacy to make their communities stronger for their kids, grandkids and future generations. “While we want to attract young people to Maine, we should not ignore what Boomers already offer Maine and our economy,” said Parham. The Governor’s proposal to create “Open for Business” zones–in particular, the “right to work” provision– is part of a national agenda to undermine the middle class and lower wages and working conditions for all workers. “This is just a recycled and repackaged version of the same old divisive policies from the Governor. It would do nothing but hurt hard working, middle class families like mine,” said Scott Bolduc, a firefighter in Bangor. “This plan hurts public safety and our communities. What we need is a Governor that is focused on real issues like raising wages and tackling inequality,” he said. “You can put a new coat of paint on it, but both Democrats and Republicans have already rejected these proposals. That’s because we can all agree these proposals are a bad idea. They would limit collective bargaining rights, and hurt everyday people we count on like firefighters, teachers and nurses,” said Cokie Giles, a nurse at EMMC. 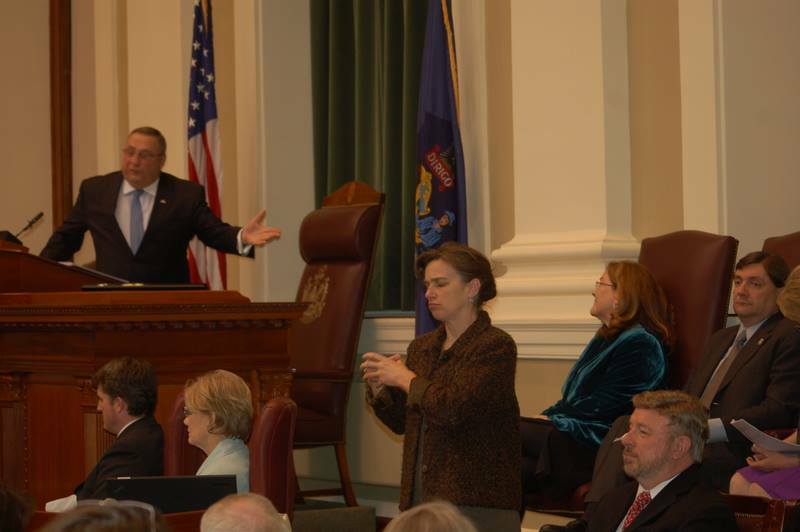 Maine Governor Paul LePage stood before a joint convention of the 126th Legislature on Tuesday evening and gave his 2014 State of the State Address. As expected, LePage touched upon a number of topics already known to be potential focal points, touted what some fellow Republicans had earlier described as accomplishments by the administration and put forth some surprising new proposals, including creation of what he described as “Open for Business Zones”, which would benefit large companies with discounted electrical rates, access to Maine capital, decreased tax rates and be free of unions, ie, small in-state “right to work” zones. Few specifics on these zones have yet to be released by the administration other than that covered by the Governor in his address. 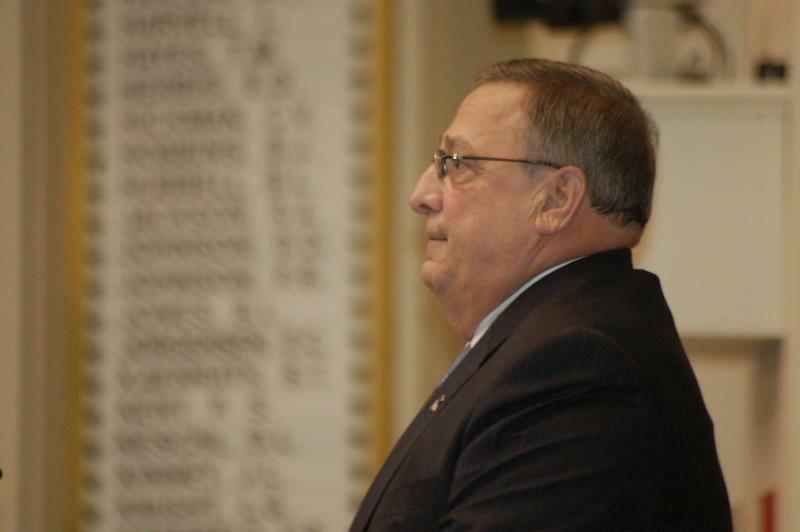 LePage surprised lawmakers by calling for a statewide TABOR referendum, similar to the efforts that voters voted down in 2006 and 2009. “Gov. Paul LePage’s third State of the State address was delivered to an assembly of Maine lawmakers, but Tuesday’s 50-minute speech was directed at the two men with the best chance of keeping him out of the Blaine House for another four years. Using a television audience and scolding and swaggering rhetoric, LePage laid out broad policy initiatives that have little chance of passing in the Democratic-controlled Legislature but will show Mainers a sharp distinction between his vision for the state and that of his challengers, Democratic U.S. Rep. Mike Michaud and independent Eliot Cutler. From his vow to create “Open for Business” zones to attract large companies that would be exempt from collective bargaining law, to a war on drugs focused on arrest and prosecution, LePage rolled out sweeping policy initiatives that will serve to define his bid for a second term. Reactions to the governor’s speech by Democrats and a large number of organizations from around the state will be shared in a follow up post. Full video of the Governor’s address is being shared in 3 parts; this is the first portion. 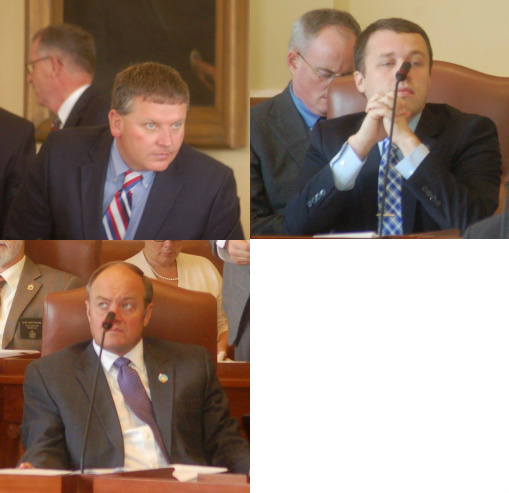 Photos taken from within the House chamber include some from the Democratic leadership press conference held immediately after the conclusion of LePage’s speech. Tonight, I am here to update you, the people of Maine, about the condition of our great state. First, I must recognize a few individuals. To my lovely wife Ann and children—please stand—I would not be here tonight without you. Ann, you have made Maine proud as our First Lady. Staff Sergeant Douglas Connolly, the military herald this evening, thank you for your courageous service to our state and nation. As we thank our men and women in uniform, we are reminded of those who are not with us. Bill Knight greeted thousands of troops returning from Iraq and Afghanistan at Bangor International Airport. A World War II veteran, Bill was part of the Greatest Generation. He died on Christmas Day at age 91. He made greeting the troops his life’s most important duty. Another veteran who is not here tonight is someone many in this chamber know and respect. Michael Cianchette, who was my chief legal counsel, is now deployed to Afghanistan. Mike is truly one of Maine’s best and brightest, and we send him our best wishes for a safe return home. Mike’s lovely wife, Michelle, is here with us tonight. Michelle, please stand. Our administration is working hard so young Mainers like Mike and Michelle can continue to live and work in our state. We want our young families to enjoy a growing economy that allows them to prosper and succeed. Mainers are a breed apart. Many of us value our individuality. We work hard. We take care of each other. I love my state. I am proud to call myself a Mainer. I want every Mainer to succeed and prosper. But Maine is at a crossroads. We have huge challenges. Higher taxes and bloated government have not improved our lives. Higher energy costs have not attracted major investments to Maine. More welfare has not led to prosperity. It has not broken the cycle of generational poverty. We cannot return to the same failed policies of the past 40 years. We are better than that. We must be bold. We must have the courage to make the tough decisions. We can do better. We will do better. We must keep our young people in Maine. Recently, I asked some Bowdoin College students, “What can we do to keep you here?” One of them was Gregoire Faucher from Madawaska. He is eager to hear what the future of Maine holds for him. Comment ca va, Gregoire? Ca me fait plasir de vous avoir ici ce soir. Unfortunately, Gregoire hears more about job prospects in Boston or New York or even New Hampshire than right here in Maine. He wants to stay in Maine. But he may have to leave to find higher-paying jobs and better opportunities. Greg and his classmates are the kind of young people we need to grow our state’s economy. We must create a business climate that encourages investment that will employ Maine people. Recruiting job creators to come to Maine is not easy. The global competition is fierce. Investment capital goes where it is welcomed and stays where it is appreciated. Since we took office, we have made Maine more competitive. Maine’s unemployment rate has fallen to 6.2%. It’s the lowest since 2008. Almost 13,000 new private-sector jobs have been created since we took office. We reduced bureaucratic red tape. We cut the automatic increase to the gas tax. We eliminated almost $2 billion in pension debt. We found efficiencies within state agencies. My proudest achievement: paying $750 million in welfare debt to Maine’s hospitals. It sent the message that, in Maine, we pay our bills. Because of our efforts, good-paying jobs are being created all over the state. In Portland, the Eimskip shipping service. In Nashville Plantation, Irving Forest Products. Maine Wood Concepts in New Vineyard. Molnlycke Health Care in Wiscasset. We are a state of entrepreneurial “doers.” There are 40,000 small businesses in Maine. Our state has roughly 130,000 microbusinesses. They employ 170,000 people. They drive our economy. If they could each add one more job, that would transform our economy. Nicole Snow of Sebec is a very successful micro-entrepreneur. She created Darn Good Yarn, and she does all of her business online. Nicole is growing her company into a million-dollar business—thanks to the internet. Nicole, please stand. Having spent my career in business, I know what grows an economy. But there is a major push by many in this chamber to maintain the status quo. Liberal politicians are taking us down a dangerous path—a path that is unsustainable. They want a massive expansion of Maine’s welfare state. Expanded welfare does not break the cycle of generational poverty. It breaks the budget. Big, expensive welfare programs riddled with fraud and abuse threaten our future. Too many Mainers are dependent on government handouts. Government dependency has not—and never will—create prosperity. Maine expanded welfare over a decade ago. 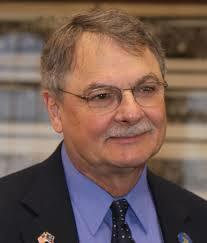 Now MaineCare alone is consuming 25 percent of our General Fund dollars. The result? Maine’s welfare expansion resulted in 750 million dollars of hospital debt. We just paid it off. Some want to repeat that mistake. Thousands of our most vulnerable citizens are on waitlists for services. They need your compassion. Michael Levasseur of Carmel has autism and needs care 24/7. Michael is here tonight with his parents, Cynthia and Paul. Cynthia had to quit her job to care for her son, and they had to downsize their house to make ends meet. With services, Michael could get a job coach, assisted-living accommodations and participate in a day program. Maine lawmakers must address these waiting lists. Michael deserves your compassion. We must set priorities on who will get services with our limited resources. Money may grow on trees in Washington, D.C., but we cannot count on promises of federal windfalls to pay for our services. Let’s be clear. Maine will not get 100 percent federal funding for welfare expansion. Maine already expanded. That means the federal government would give us less money than other states that are expanding now. Adding another hundred thousand people to our broken welfare system is insanity. It is unaffordable. It is fiscally irresponsible. Expanding welfare is a bad deal for working Mainers who have to foot the bill. Liberals believe that giving free health care to able-bodied adults, while leaving our most vulnerable in the cold, is compassionate. I disagree. We must show compassion for all Maine people. We must protect our hard-working families from the higher insurance premiums and higher taxes that will result from further expansion. Do not focus on the next election. You must focus on the next generation. GOP rises to applaud as LePage restates his views on EBT fraud, which his own documentation found to be at a rate of 0.2%. We owe the next generation a society that provides them with prosperity and opportunity, not welfare and entitlements. I will not tolerate the abuse of welfare benefits. Maine’s limited resources must be reserved for the truly needy. Maine EBT cards provide cash for Temporary Assistance for Needy Families. This cash is supposed to purchase household items for needy children. Every dollar that goes to buy cigarettes, alcohol or lottery tickets is a dollar taken away from a needy child, family or others who need services. My proposal will prohibit TANF funds from being used for alcohol, tobacco, gambling and other adult entertainment. We will limit the use of Maine EBT cards to Maine—not Hawaii, not Florida. If you want to ask the taxpayers for money, you should make a good-faith effort to get a job first. We will require those seeking welfare, if able, to look for a job before applying for TANF benefits. Maine taxpayers are being punished because our welfare program far exceeds the federal guidelines. Maine has been so lenient with its work exemptions, the federal government has fined us millions of dollars in penalties. We must eliminate exemptions that excuse TANF recipients from work. There is no excuse for able-bodied adults to spend a lifetime on welfare at the expense of hard-working, struggling Mainers. That is not what I call compassion. As John F. Kennedy said in 1961: “Ask not what your country can do for you, ask what you can do for your country.” These are words that still ring true today. I know generational poverty. But I escaped generational poverty, and lived the American Dream. 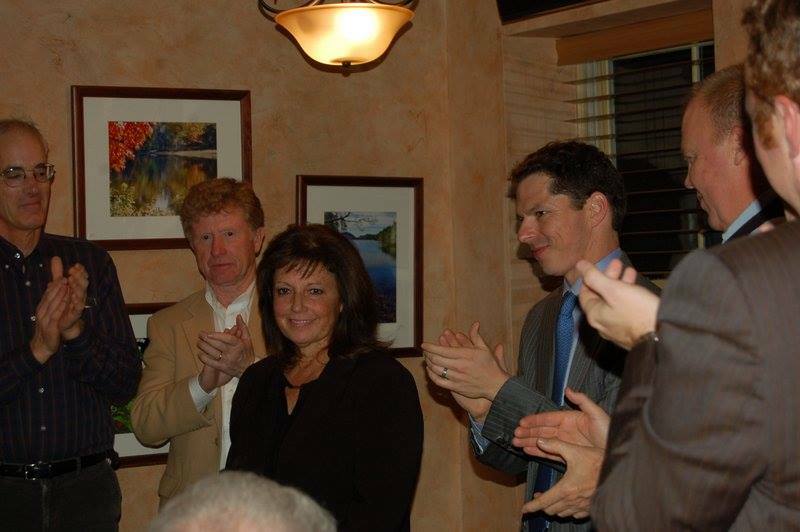 Some caring Maine families took me in from the streets of Lewiston and gave me the guidance I needed to succeed. I have said it many times. Education saved my life. Throwing money at poverty will not end poverty. Education and mentoring will end poverty. Our bridge year programs are providing educational opportunities for Maine students. The Business Academy in Biddeford recently presented 33 students with a total of 126 college credits. We saved these students thousands of dollars in college tuition. In Fort Kent, 17 students have completed their freshman year at college upon graduating high school. This spring, students in Hermon will graduate high school with diplomas and technical proficiencies and trade licenses. Many lawmakers, the union and school superintendents have opposed our reforms at every step. But I vow to always put our students and our teachers first. To strengthen Maine’s economy, we must invest our resources to improve infrastructure, reduce taxes and lower energy costs for homeowners and businesses. Industry needs infrastructure to move goods and services at the speed of business. Over the next three years, MaineDOT will invest over $2 billion in infrastructure improvements. We will repair or replace 54 bridges and reconstruct hundreds of miles of state roads. We will improve our ports, rail, airports and transit infrastructure. The plan supports over 25,000 jobs in highway and bridge projects. Thousands more jobs will be supported by the plan’s investments in ports, rail, ferries and buses. That’s putting Maine to work. But we still face barriers that make Maine less competitive. Heating and electricity costs remain a major obstacle. Our homeowners spend well over $3,000 a year to heat their homes. That’s nearly double the national average. Maine families know that this winter has been more challenging than most. Distribution of natural gas expanded this year in Southern and Central Maine. Mainers are saving more than a thousand dollars a year by converting to natural gas. More funding is now available to help Mainers convert to more affordable heating systems. These systems include wood pellets, advanced oil systems, natural gas systems, energy efficiency improvements, heat pumps – anything that will cut costs for Maine homes. High electricity costs make it very difficult to attract business. My administration is working to expand pipeline capacity from Pennsylvania to take full advantage of the natural gas supplies in that state. Also, our neighbors in Quebec have the best clean-energy resources on the planet. My Administration is fighting for access to this cost-effective and clean source of electricity along with the rest of New England. Many lawmakers have chosen to support powerful special interest groups over the needs of Maine’s ratepayers. Let’s be clear. I do not favor one form of energy over another. I am on the side of those who want to lower the costs for working Maine families. Whose side are you on? Tonight I am proposing a bold new idea to attract companies that will invest more than $50 million and create more than 1,500 jobs. “Open for Business Zones” will offer discounted electricity rates; employment tax benefits; and provide access to capital. Companies in these zones will get assistance to help recruit and train workers. Employees in these zones will not be forced to join labor unions. They will not be forced to pay dues or fees to labor unions. This will allow Maine to compete with right-to-work states. Companies in these zones must show preference to Maine workers, companies and bidders. Our proposal combines the kinds of incentives that other states have used successfully to attract major investment. We must be able to compete with them. We must be bold. We must show young people like Gregoire that we are serious about providing good-paying jobs and opportunities for him and his classmates. States with the highest economic growth often have the lowest overall tax burdens. We are working hard to combat Maine’s reputation as a high-tax state. We passed the largest tax cut in Maine’s history. Two-thirds of Maine taxpayers will get income-tax relief. Liberals call it a “tax break for the rich.” But 70,000 low-income Mainers will no longer pay income tax. We cut taxes for the working poor. This is compassion. We put money in people’s pockets. We told the business community we are serious about tax reform. I am proud of the progress we made. But we need to do more. Our tax system is out of date. It is not competitive with other states. So let’s ask Mainers in a statewide referendum if they want to lower taxes. We must lower our income tax rates and eliminate the estate tax to bring Maine’s tax system into the 21st century. This would make Maine more attractive for people to work and raise their families here. It would encourage retirees to stay in Maine. This will protect our working-class families from bearing an unfair tax burden. My proposal also includes a limit on the growth of state spending. This will provide much-needed relief to Maine’s taxpayers. Let’s stop arguing about tax reform. Let’s ask the people who really matter. Let’s ask Maine’s hardworking taxpayers. We will ask Mainers a simple question at a statewide referendum. We will ask if they want to lower taxes by at least $100 million and reduce state spending by at least $100 million. We think Mainers want tax relief. Let’s give them the option to decide. Finally, we must confront a troubling epidemic. It is tearing at the social fabric of our communities. While some are spending all their time trying to expand welfare, we are losing the war on drugs. 927 drug-addicted babies were born last year in Maine. That’s more than 7 percent of all births. Each baby addicted to drugs creates a lifelong challenge for our health care system, schools and social services. The average cost for drug-addicted births in 2009 was $53,000. Welfare programs covered nearly 80 percent of those increased charges. More important than cost are the effects to these innocent children. I am deeply concerned about the suffering and long-term consequences these newborns are subject to. It is unacceptable to me that a baby should be born affected by drugs. We must show them our compassion. There were 163 drug-induced deaths in Maine in 2012. The use of heroin is increasing. Four times as many people died from a heroin overdose in 2012 than in 2011. Over 20 percent of the homicides in 2012 were related to illegal drugs. We must address the problem of drug addiction and drug trafficking. We must act now. We need to fully fund the Maine Drug Enforcement Agency. Our police chiefs tell us local law enforcement officials need more resources to fight the drug problem in our state. Auburn Police Chief Phil Crowell is the president of the Maine Chiefs of Police Association. He is here tonight to show that the chiefs fully support our administration’s war on Maine’s drug problem. I am pleased the county sheriffs also enthusiastically support our initiative. As Henry Ford said: “Coming together is a beginning; keeping together is progress; working together is success.” The judicial, executive and legislative branches joined forces in an effort to eradicate domestic violence from our state. We need to come together once again to combat Maine’s drug problem. My proposal adds four new special drug prosecutors and four new judges to sit in enhanced drug courts in Presque Isle, Bangor, Lewiston and Portland. Since local agencies do not have the manpower or resources they need to fight Maine’s drug problem, we will add 14 MDEA agent positions. We must hunt down dealers and get them off the streets. We must protect our citizens from drug-related crimes and violence. We must save our babies from lifelong suffering. In closing, I welcome common-sense solutions from anyone who wants to put Maine on the right path. Success doesn’t happen by doing nothing. Bring me bold solutions. Put your politics aside. Fight for the future of Maine’s children. We must show them the path to succeed. God Bless Maine and God Bless America. Now, let’s get to work.